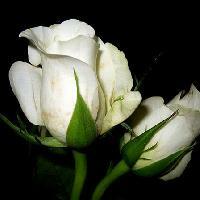 White rose flowers symbolize beauty and represent true and young love. White roses are filled with spirituality and stand for purity, hope and virtue. They are also considered as a symbol of secrecy because of their discreetness. They also symbolize reverence and are often used at memorial services and funerals. This beautiful lily opens into a classic bloom revealing eye catching lime white petals. Their unique shape and pure bloom colour are marvellous creation that brides often choose for their weddings. It enhances the royalty of a bouquet when used in a flower arrangement. 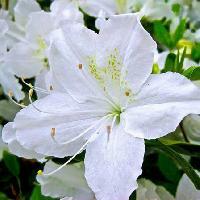 White lilies symbolize purity and virginity. White Calla lily is a large trumpet shaped flower that rests upon a long and smooth stem and symbolizes magnificent beauty. These white or creamy lilies are well known for its astonishing beauty and innocence.? 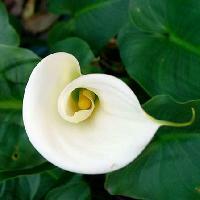 It is also believed that white calla lily is the symbol of Jesus resurrection, its trumpet like shape stands for victory. It is also associated with angels, symbolizing divine purity, holiness and faith. White orchid is not as common as the coloured one and is considered as the rarest type of orchid. The flower looks extremely elegant and pure and stands out in every flower arrangement making it look exotic. 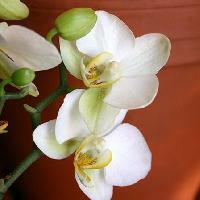 White orchids stand for purity, innocence, virtue and divine beauty. It is often considered as a symbol of elegance and glamour and is sure to dress up any wedding bouquet. Tulips are one of the most loved flowers of the world and are an absolute beauty to the eye. 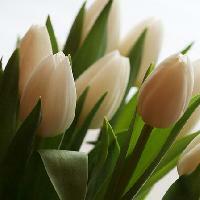 White tulips are spring flowers which symbolize warmth, beauty and new beginnings.? It is perfect for any occasion and represents purity, forgiveness and serenity. It is often given as a token of forgiveness, so gifting these flowers can be the perfect way to apologize to someone. In the language of flower, it stands for claiming worthiness. White carnations are simple and sophisticated classical blooms with a wholesome and extravagant look. White carnations are of 3 types, the light and regular carnations with a big bloom at the top of the stem, the spray ones with smaller flowers and the short or dwarf ones which have one stem with several flowers. A white carnation bouquet with its divine beauty is perfect for Mothers Day celebration and wedding ceremonies. 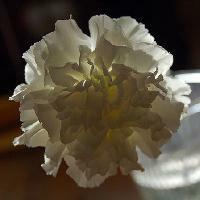 White carnations stand for perfect love and innocence. Gerbera daisies, with their wide spread blooms are lavishing flowers that have been admired for their exquisite beauty. The pale white blooms, complemented with a black center bulb and green stem makes it look extremely gorgeous. This cheerful flower can brighten any ones day and lift peoples mood in a matter of few seconds. 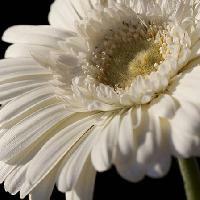 White gerbera daisies stand for sentimental clarity and beauty. White hibiscus is a breath taking beautiful flower that is used not just for decorative purpose but is also used for its healing properties and to cure diseases. 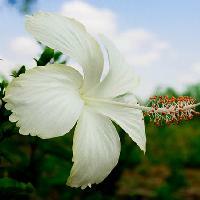 White hibiscus symbolizes purity and fertilization and stands for seize the opportunity in the language of flowers. Hydrangea is a snowball shaped flower which looks like a white cotton candy on a stick. It is made up of smaller white blooms with a faint blue ball at the center. 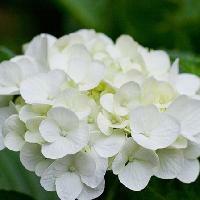 White hydrangea is mainly suited for gardens but is at times also used for bouquet arrangement purpose. White hydrangea is a symbol of friendship and devotion and represents deep understanding. White daisies are innocent looking simple flowers that are often used for bridal bouquets, for decoration purpose and as sympathy flowers. The beautiful white flowers symbolize innocence and purity, simplicity and new beginnings. 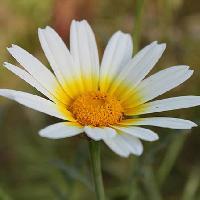 White daisies are also considered as a secret flower and hide secret love messages in the language of flower.